Vastu Shastra Humans are not separate from nature but connected to earth as a part of an interconnected web of life. The element of nature act as a whole to create and maintain an energy — the force of life. An energy efficient environment attracts many benefits and more positive opportunities. Water element is one of the most strongest element of the Vastu Shastra. Water is what gives life on our planet. Without it, we would not exist. Water is the essence of life. Water has always been synonymous with authority as well as power. The effects of a water body in a home are amazing. Our bodies and mind welcome a cooling effect of the water. During ancient times, water has been used as an elemental solution by the kings by placing their palaces near bodies of Water. If you look at world most capital cities today, they are either located near the water or have large rivers or lakes nearby. Majority of ocean-side and lake-side properties are usually more expensive. Water body near the house or business premises is a good placement because it keeps the energy flowing and prevents it rather from being “locked”. Its real essence speaks of movement and the flow of life. It invites everyone to move and bend and not to stay rigid or to struggle. Moving and flowing water can encourage those who come into contact with it to accept continual change and not to struggle unnecessarily in life. 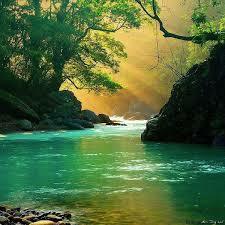 Flowing water can ease tensions and allow the vibrations of the life force to enter us and nourish our aura. If properly applied, the water element can make a world of difference. Water installed into a wrong direction might have a the reverse effect on you as well as the inhabitants of your premises. Sources of Water element in Vastu Shastra are stream, River Pond, Swimming pool, Water fountain, Waterfall, Fish Tank, Water Pot (Mangal Kalasha) and, also a waterfall painting. Even any art representing water can be included in this list. There are simple ways to use the Water element of Vastu Shastra theory to create balance, harmony and, also prosperity in your surrounding. 1. The body of water should not be too huge compared to the actual premises or it can energetically dominate the site and weaken the occupants growth. 2. Shape and placement of the body of water are very important. Best place according to Vastu shastra is at north east zone. It should not be on the edge of the north-east axis. Waterfalls and fountains create new energy flow in any environment. A well placed fountain can have a beneficial impact on any space. 3. Fish aquariums are also another powerful water energizer. Fish tanks are a combination of water and living energy which stimulates the flow of new energy flow. Aquariums with fish are notorious for bringing good luck, fortune and, also a stream of wealth to the occupants. You will also find them in many corporate houses, hotels as well as restaurants. 4. Avoid placing the fountain in the south-east area of the house or office, which is a location of the fire element and because water puts out the fire it can have a dampening effect on your finances. 5. Finally, a circulating or moving water is more powerful than stagnant water Fountains placed at the front door can also deflect negative energy from entering the home. Space around you affects your performance, health and relationship. Vastu offers simple space healing techniques for your home or business. Mail your house plan on [email protected] or Click here to send information.